Home > Hunterdon County > Calling all cooks! 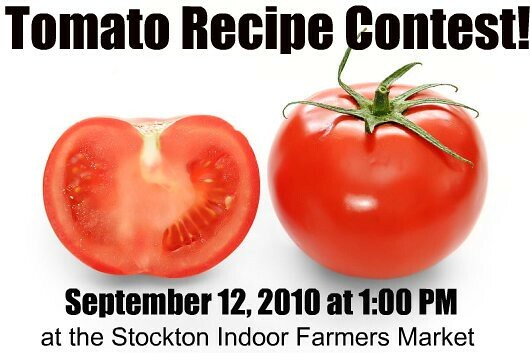 There will be four categories: Best Savory Tomato Dish, Best Sweet Tomato Dish, Best Tomato Drink, and Best Overall. Judging will be done by some super-foodies in the area, including Melissa Hamilton of Canal House Studio. Space is limited, so reserve soon. It’s $10 to enter (all money goes to the Market Music Fund). Hope to see you there — I’ll be snapping photos of the winning dishes to show off here on Jersey Bites. Sunday, September 12, 2010 at 1:00 p.m.
Robin Damstra is the Regional Editor for Hunterdon and Mercer Counties. She also writes for her food blog, Caviar and Codfish, where she shares her culinary discoveries and gorgeous food photography. She currently lives in Stockton, New Jersey and runs The Half Pint Kitchen, a small-batch ice cream, gelato, and sorbet shop inside the Stockton Indoor Farmers Market, open Fridays-Sundays during market hours.